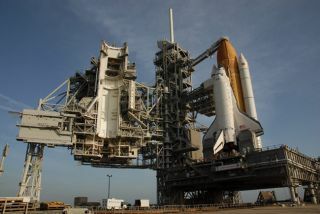 Access platforms at Launch Pad 39A are moved into position against Space Shuttle Discovery. Discovery arrived at its seaside launch pad and was hard down at 6:06 a.m. EDT on May 3. WASHINGTON —A bill mandating that NASA conduct an additional space shuttle flight todeliver a $1 billion science payload to the International Space Station clearedthe House Science and Technology space and aeronautics subcommittee May 20. Lawmakers wastedlittle time approving the NASAAuthorization Act of 2008 (H.R. 6063) and sending it to the full committeefor consideration. With no amendments offered, Rep. Charlie Melancon (D-La. )gaveled the markup session to a close less than six minutes after it began. Melanconwas filling in for Rep. Mark Udall (D-Colo.), the subcommittee's chairman, whowas forced, by airplane trouble, to miss the markup of the legislation he hadintroduced five days earlier. H.R. 6063,in addition to requiring NASA to fly the AlphaMagnetic Spectrometer to the space station as originally promised, setsgenerous spending levels for the U.S. space agency that congressionalappropriators are free to ignore. The bill authorizes a $19.2 billion budgetfor NASA for 2009, or about $1.6 billion more than the White House isrequesting. The billalso would authorize appropriators to give NASA an additional $1 billion in2009 expressly for the purpose of accelerating development of the Orion CrewExploration Vehicle and Ares I launcher. Orion andAres currently are on track to enter service inMarch 2015, some four-and-a-half years after the space shuttle is due toconduct its last flight. Thelegislation would permit NASA to remain on course for returning to the Moonaround 2020 but encourages the agency to embrace international collaborationmore fully as it pursues its space exploration goals. If H.R.6063 becomes law as is, NASA would be required to name the United States' firstlunar outpost after Apollo 11 astronaut Neil Armstrong, the first person toset foot on the Moon, and to design the outpost to operate for extended periodswithout humans present. On thescience front, the bill would authorize NASA to proceed with development ofGlory, the climate-monitoring satellite that breached Nunn-McCurdy-like costcontrols put in place by the 2005 NASA Authorization Act. The Nunn-McCurdy lawrequires the Pentagon to notify Congress and take various corrective actionswhen programs experience cost growth that reaches certain thresholds. NASA alsowould be required to produce a plan for ensuring continued collection of thetype of thermal infrared land imagery returned by the Landsat 5 and 7satellites. The Landsat spacecraft NASA has in development for a 2011 launchdoes not include a thermal band. Under the bill, NASA would be required topresent Congress with an option for adding a thermal band to the Landsat DataContinuity Mission while minimizing the cost and schedule delay associated withthe change. Rep. TomFeeney of Florida, the subcommittee's ranking Republican, attributed the bill'seasy approval by the panel to the bipartisan spirit in which it was drafted. Hepraised Richard Oberman, the subcommittee's Democratic staff director, forengaging Republican staff in the process from the beginning.